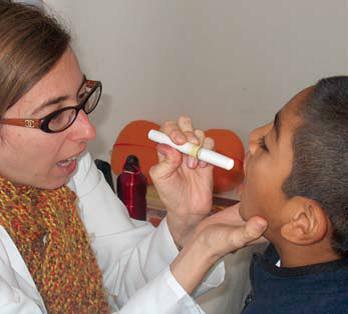 Fatima Dantas, a speech language pathologist, assesses a patient in Peru. TFW continues to partner with Amonizar, a non-profit organization supported by a local team of volunteer medical professionals in Lima, Peru. In 2011, following a feasibility study, TFW established a project to provide decentralized care for families of children with CLP in four poor areas of Lima. The project will span three years, beginning in 2012 and aims to develop an effective, adequate and comprehensive care model to offer complete health care. The focus of the project will be four Community Rehabilitation Centres (CRCs). These CRCs will mitigate many obstacles, including geographical distance, allowing low-income families better access quality treatment close to their homes. For more information on our Peruvian project, click here.